P2246 code - Engine running for 15 seconds, O2 sensors at operating temperature and battery voltage greater 10.4 volts. The PCM detects that the reference signal voltage is greater than 3.9 volts for nine seconds. The Oxygen sensors (O2 sensor) are used for fuel control and catalyst monitoring. Each O2 sensor compares the oxygen content of the surrounding with the oxygen content of the exhaust stream. When the engine is started, the powertrain control module (PCM) operates in an open loop mode, ignoring the o2 sensor signal voltage while calculating the air to fuel ratio. The heating elements inside each O2 sensor heats the sensor to bring the sensor up to operating conditions faster. This allows the system to enter closed loop earlier and the PCM to calculate the air to fuel ratio sooner. While the engine runs, the O2 sensor heats up and begins to generate a voltage within a range of 0-1,275mV. 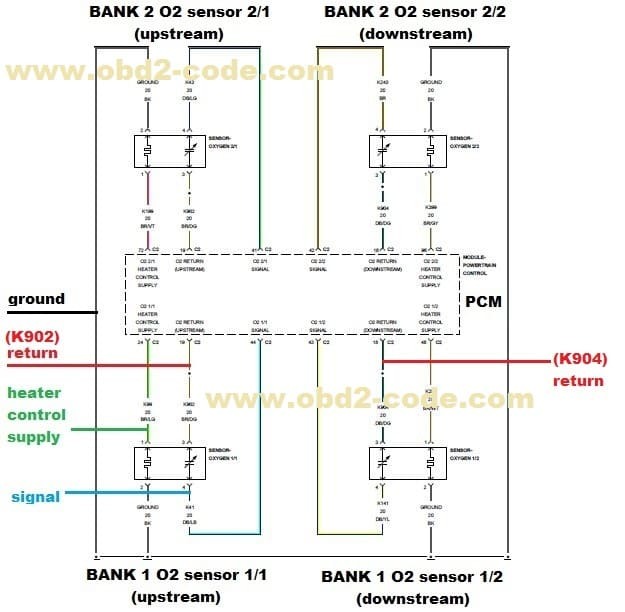 Once suffient O2 sensor voltage fluctuation is observed by the PCM, closed loop is entered. The PCM uses the O2 sensor voltage to determine the air to fuel ratio. An O2 sensor voltage that increases toward 1,000 mV indicates a rich fuel mixture. An O2 sensor voltage that decreases toward 0 mV indicates a lean fuel mixture. Ignition on, engine not running. With the scan tool, select view DTCs. Copy DTC and freeze frame information. Allow the engine to reach normal operating temperature. Monitor the scan tool for at least two minutes. With the scan tool, select view DTCs. Is the status active for this DTC? Disconnect the PCM harness connector. Disconnect the O2 sensor 1/1 harness connector. Disconnect the O2 sensor 2/1 harness conenctor. Measure the voltage of the O2 sensor return circuit reference voltage at the O2 sensor 1/1 or 2/1 harness connector. Yes, repair the O2 sensor signal circuit for a short to voltage. 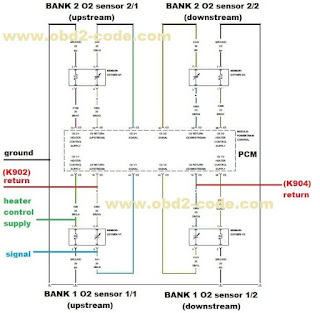 Measure the resistance of the O2 sensor return circuit reference voltage circuit between the O2 sensor 1/1 or 2/1 harness connector and the PCM harness connector. No, repair the O2 sensor 1/1 or 2/1 signal circuit for an open circuit or high resistance. Connect the PCM harness connector. With the scan tool, monitor the O2 sensor 1/1 and 2/1 voltage. Connect a jumper wire between the O2 sensor 1/1 signal circuit and the O2 sensor return circuit at the O2 sensor 1/1 harness connector. Repeat step 5 for the O2 sensor 2/1 signal circuit. Is the voltage between 2.3 and 2.7 volts with the jumper wire installed? Yes, verify that there is good pin to terminal contact in the O2 sensor and powertrain Control Module (PCM) connectors. Replace the O2 sensor not indicating the specified voltage if no problems were found with the connections. No, remove the jumper wire before continuing, go to step 5. 0 Response to "P2246 O2 sensor 1/1, 2/1 Reference Voltage Circuit High"